I'm trying to read more middle grade and children's fiction this year! I've been working as a children's librarian, which is amazing, but I've realized that I'm really not "with it" anymore. Kids come in asking for suggestions and it takes me a good twenty minutes to pinpoint a book in their reading level that fits their description. I know it's partly because kids can be picky and weirdly specific, and because programs like Accelerated Reader are slowly prying all the magic and discovery out of reading by pigeonholing kids into a very narrow "reading level" range from which they can pick from and earn points on books they're not really into in exchange for paltry rewards like a holographic bookmark or the prestige of being the principal, who instituted the heinous Accelerated Reader program in the first place, for a day. Has any child used their chance at being principal for the day to abolish the Accelerated Reader system? Anyway, I've realized I need to be better informed so that when a kid tells me they can't read a book that really looks amazing because it's .01 points below their assigned reading level, I can tell them exactly what they're missing, thereby sowing the seeds of discontent in a new generation. 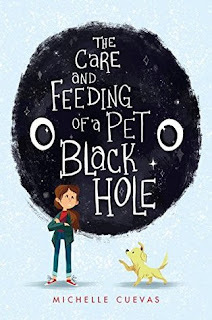 The Care and Feeding of a Pet Black Hole is a book I'll proudly dangle in front of the reading level-bound masses. It took me a few chapters to get into it - our main character, Stella, is sarcastic and the whole book is just a tad tongue-in-cheek, which was jarring as I had already wrongly typecast this as being a sad book only (Stella is dealing with the loss of her dad); it takes place in the 1970s and I realized that way too late and after too many Carl Sagan references; and everyone has weird space names (Cosmo, Tony Luna, Stella, etc). But, once I got in the groove, I grew to love this book. It features a funny, sarcastic girl who loves science and dreams of working at NASA someday. She's strong and brave and isn't embarrassed to love her stinky, weird brother. Her father recently passed away and she's struggling with her emotions, but that's okay! It doesn't make her weak or girly - it makes her human. "They say that a black hole lives at the center of every galaxy. And I believe that now. There would always be a black hole at the center of me, my galaxy, my life. But it's mine. It's part of me. I faced it. I trained it. I tamed it. And finally, I set it free. There's a hole at the center, but that's okay, because it's full of such beautiful, beautiful things." "I felt less alone, that was for sure. I realized how much my brother and I needed each other. I realized how much I took Mom for granted, and how much I missed her while we were gone. I guess that's what pain can do if you allow it: crack you open, let light in, and show you what's on the inside. Our adventure through the dark had shown me shades and hues of myself that I couldn't have otherwise seen." All of that for a whopping 5 Accelerated Reader points!!!!! !